At a function held yesterday (Saturday) afternoon to develop friendships between the Muslim and Taiwanese communities of Brisbane, Mr. Wayne Ko, the Secretary General of the Queensland Federation of Taiwanese Associations gave a background to Taiwan and Mr. Ted L. M. Liao, Director of the Taipei Economic and Cultural Office Brisbane, spoke on the local Taiwanese community. Our Man-on-the-Mussallah has it on good authority that the Hope for Happiness Ladies Fashion Show held last night (Saturday) was a resounding success with over 300 ladies in attendance. CCN has exclusive photos of the event. TARIQ Ramadan, Professor of Islamic studies at Oxford University, was the keynote speaker at the Conference organized by the Griffith Islamic Research Unit during the week. Professor Ramadan spoke for more than an hour to dozens of academics, students and ministers of religion at the conference at Griffith University. Accused of tailoring his message for Western audiences Ramadan told his audience that Muslim immigrants could practise their religion while still embracing the culture of their adopted country. After the speech, Professor Ramadan confirmed he had previously advised the Howard government on Islamic integration, saying he had recommended strategies and policies to promote "a sense of belonging" for Muslim immigrants. Professor Ramadan was banned from entering the US in 2004 after the US Government found he had donated $940 to two humanitarian organisations that gave money to the Palestinian terrorist group Hamas. He has consistently denied links to terrorism and again defended his donations yesterday. "I gave this money between 1998 and 2002 - one year before this organisation was blacklisted in the States," he said. He continued, to laughs from the audience: "I should then have reasonably known, one year before the Department of Homeland Security, that this organisation would be blacklisted?" Laurie Ferguson, federal Parliamentary Secretary for Multicultural Affairs, introduced Professor Ramadan at the conference on Islam in the Western world, describing him as one of the "most influential international experts" on the subject. "Professor Ramadan has already made an important contribution to Australian government thinking on Islam and the West, through a video-link discussion between London and Canberra last year," he said. He said it was possible for immigrants to be Muslim by religion and Australian by culture, while still remembering their past in their home country. Professor Ramadan said it was possible for Muslim immigrants to belong to the international Islamic community without undermining their loyalty to their adopted country. He has also advised the British Government and was named one of the 21st century's great innovators by Time magazine. Irfan Yusef (Solicitor of the Supreme Court of NSW) who entertained the delegates with his treatise on the monolithic Muslim. What is a sock doing here? It was a gorgeous early Sunday morning. Birds were happily chirping, the trees swayed back and forth slightly from the gentle breeze, the air was so crisp and fresh and what were we doing? Sleeping in? Nope! 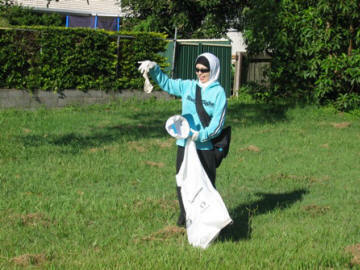 Participating in Clean Up Australia Day, that’s what! 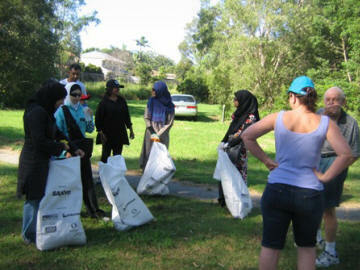 MY Services and AMARAH teamed up with Brandon Road Bushcare Group to put on a local clean up at Williams Park. Approximately 35 people showed up for the event. 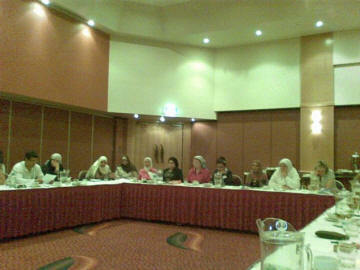 About one third of the participants belonged to the Muslim community. As early in the morning as it was, these determined stewards of the environment dragged themselves out of bed to help make small steps to make our planet greener and healthier. Armed with disposable gloves and garbage bags, we scavenged the park for trash that desecrated the beauty of the park. 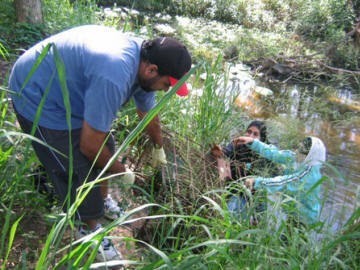 We even had two courageous Muslim girls with the aid of a fellow Muslim brother get soaked in the creek while trying to pull out a rusty old trolley! A congregation of the volunteers evaluating each other’s trash! Now that is determination! Although we did not garner as much trash as previous years, it shows that we, as inhabitants of this planet, are becoming more environmentally conscious of our actions. This event also demonstrates that the Muslim community, too, shares environmental ethics with this surging global environmental movement. To end the clean up, we all scarfed down sumptuous halal sausage sizzles in celebration of our triumphs over environmental ignorance and evils! If you want to help out, it’s not too late! If you are interested, please contact Shajaroh via email at shajaroh@gmail.com. Jumping into the creek to get rid of this unwanted visitor of the creek! Nothing like freshly grilled sausage sizzles after working up a sweat! 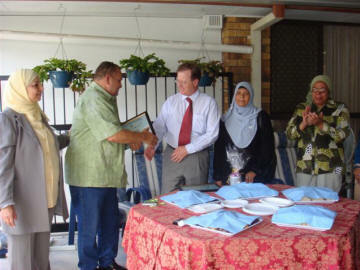 The Alba nian Muslims in Mareeba began their life there in the tobacco industry in the 1920's and are now still an important part of the community in a wide range of businesses and professions. Their life of faith and friendship and peace emanates from both their mosque and their hall in this tropical place of great beauty in the tourist North. The Encounter program on ABC National is a highly acclaimed series which explores the connections between religion and life. 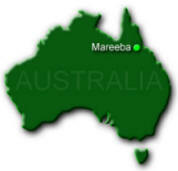 In a recent edition in the series producer Florence Spurling talks with the Muslims of Mareeba. 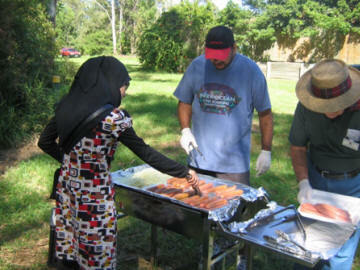 Kuraby Madrassah will be hosting a fundraiser BBQ on 3Ot March. There are stalls available for selling, exhibiting or providing a service. You can also promote your business, company, services or products by putting up BANNERS FOR THE DAY. Contact Riaz Gutta on 0400 105 786 for more information. He has been banned from entering the United States, he's advised Scotland Yard, the British Government and the previous Australian Government. He is accused of doublespeak and terrorist links. What did Oxford based Muslim scholar, Tariq Ramadan, have to say to an international audience in Brisbane this past week? 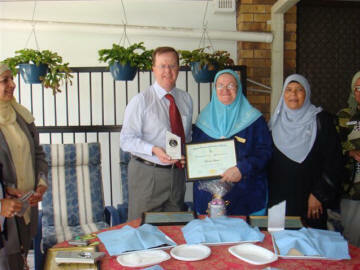 The Islamic Women’s Association (IWAQ) had its 15th year celebration on the 9th of February 2008. We took this opportunity to celebrate IWAQ’s success and acknowledge our appreciation to the long-time workers and those in the community who have supported IWAQ for the past 15 years. 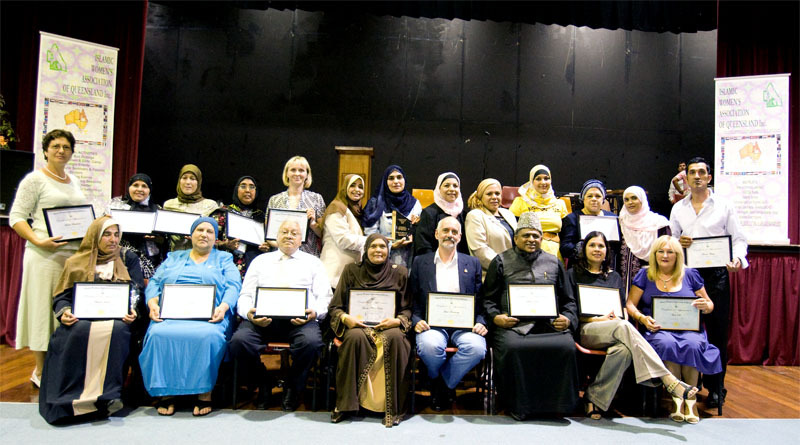 Recipients included Suad Mufti, Fatima Ismail, Anab Keinan, Fatat Issa, Sabiha Becirbasic, Wimarat Fazil, Ghiwa Kanafani, Aemna Deen, Azza Elmekawi and Hassan Fawaz from the long-time workers. 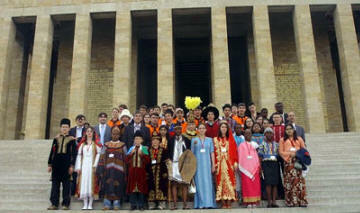 Rita-Prasad Ildes, Fatima Abdel-karim, Sultan Deen, Nizam Deen, Gail Ker, Jihad Armstrong, Hendrika Johnson, Fausia Nathie, Mohammed Tammoum, Hon. Stephen Robertson, Kerry Rea and Elizabeth Robin from the community. 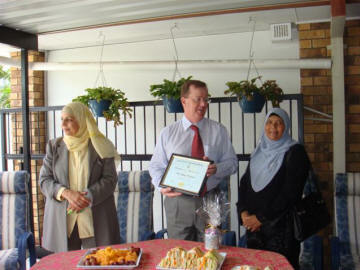 The event was also attended by Graham Perrett, Member for Moreton, who handed out the awards. The evening was very well received and attended by the award recipients, their family and friends. There were many proud moments and high emotions. Feedback from the event was very positive and people loved the entertainment and food. We would like to thank all those who organised the event, helped on the day and of course those who attended. At a special event on Friday 15th February, IWAQ took the opportunity to award some members of staff and community who have supported IWAQ namely Emad Elshemy, Annette Yunus, Galila Abdelsalam and Muna Ibrahim. This was attended by Hon. Stephen Robertson who handed out the awards. All at IWAQ felt very proud of the great achievements, hard work, commitment and dedication of every single person who supported IWAQ through these years. Thank you to all. IWAQ will be providing driving lessons on an automatic transmission car through a qualified instructor. Lessons will cost $35 per lesson. Booking is essential for these lessons and a current Learner’s Permit must be available to be sighted by the instructor. Please call the office on 3272 6355 or 3272 6422 for further information and to book your lessons. Stand-up comedy about all the things you are scared to think about: Islam, race relations, sedition, and the War on Terror. After a sold-out extended season at the Melbourne Fringe Festival 2007, two young Australian Muslim comedians are coming to shock and awe audiences with their dark humour in a bold one-hour stand-up comedy show that is a timely antidote to today's culture of paranoia. Featuring Nazeem Hussain (Vic State Finalist, Raw Comedy 2007) and Aamer Rahman (Vic State Winner, National Runner-Up Raw Comedy 2007). The Muslim initiative was a response to the Pope's controversial speech at Regensburg University in his native Germany in 2006, where he appeared to describe Islam as inherently violent and irrational by quoting a Byzantine Emperor. He later said he had been misunderstood, and prayed alongside an imam at the Blue Mosque in Istanbul during a visit to Turkey. The first summit of the Catholic-Muslim Forum will take place on 4-6 November, the Vatican said, with nearly fifty delegates, and will be addressed by the pontiff. The chosen theme is "Love of God, Love of Neighbour." UK: The Chancellor is expected to close a loophole in Sharia finance rules that have allowed commercial property investors to avoid paying stamp duty on more than £1 billion of deals. Alistair Darling is expected to tighten the rules on mortgages that comply with Sharia – or Islamic law – in his inaugural Budget after commercial property developers discovered a quirk in the legislation that allowed them to escape stamp duty. The Government brought in changes to the stamp duty regime three years ago amid concern that homeowners opting for Sharia-compliant mortgages were paying stamp duty twice. The 2005 Budget brought in measures to correct this anomaly but inadvertently created a tax avoidance opportunity that property developers have rushed to exploit. More than £1 billion of commercial property deals over the past two years have escaped stamp duty at 4 per cent. I met Medine in the coastal town of Le Havre, in a scaled-down version of France's notorious banlieues. Medine was here - hunched into a parka against the chill sea breeze - to practice in the municipal dance hall. He was brought up in the bleak tower blocks that overshadow the place, and was once a member of the disenchanted Muslim youth who preached to French society about its decadence and immorality. He was named after the Muslim holy city of Medina. Now his CDs and live performances send a different message - the offer of a new deal, and full participation in a secular society, and of a readiness to compete for success in a free market and liberal democracy. See the Akhtar family at a weekend lunch, and the renewal of Islam in America seems inevitable and irresistible. Shahid and Mino Akhtar were born in Pakistan and, like their son and three daughters, they are devout Muslims who attend the mosque regularly. IT IS a long way from the Anatolian plains to a campus in the heart of London, where eminent scholars of religion deliver learned papers. And the highlands that used to form the Soviet border with China, an area where bright kids long for an education, seem far removed from a three-storey house in Pennsylvania, where a revered, reclusive teacher of Islam lives. What links these places is one of the most powerful and best-connected of the networks that are competing to influence Muslims round the globe—especially in places far from Islam's heartland. The Pennsylvania-based sage, Fethullah Gulen, who stands at the centre of this network, has become one of the world's most important Muslim figures—not only in his native Turkey, but also in a quieter way in many other places: Central Asia, Indochina, Indonesia and Africa. Religious scholars in Turkey have called on the Turkish population to refrain from violent acts or protests over a film made by a Dutch politician that strongly criticizes the Quran and claims the holy text promotes violence and intolerance. Dutch Parliament deputy Geert Wilders, known for his anti-immigration stance, announced earlier this week that he has completed his film, "Fitna" -- an Arabic term used in the Quran and sometimes translated as "strife" -- which likens the Quran to Adolf Hitler's "Mein Kampf" and charges it with promoting violence and intolerance. Wilders said he was currently in negotiations with television stations for its broadcast, likely to be in late March or April. Are you a Muslim Female wanting information about Australian Workplace Culture? Are you thinking about changing Jobs or are looking for employment or training? Are you interested in learning about Resumes, Cover letters, Selection Criteria, interview techniques? Q: Dear Kareema, I have been working out regularly for about 6 months (walking and running) and have lost almost 14kg. I would still like to lose more weight but am struggling at the moment. Can you suggest anything more I can do or should I be patient? A: STEP IT UP A NOTCH!! You’ve done great so far and there is NO TURNING BACK now!! If you have no injuries and have been cleared for exercise by your GP, then you deserve faster results for your hard work. Making life-altering changes is never easy, you need to add three days of high-intensity strength circuits to your routine. Try a pump class if you haven’t already done so. The walking and running has given your body the stimulus to burn fat, NOW YOU NEED TO GIVE IT MORE. Remember that you may have hit a plateau (which means the body needs to adjust to all the changes it’s been going trough). 1. This one is great for chicken and green peppers or bhindi & potato or paneer and green peppers. Marinate the meat or vegetables in the paste and stir fry in 1 tbsp sesame oil. The Chinese sesame oil is better – It has a touch of soy as well which makes it different from the Indian till oil. 2. I like to use this for chicken & roasted cashews (about ¼ cup). You can try mushrooms and cashews for a vegetarian alternative. Marinate the meat, stir fry and then add the cashews at the end. • Stir fry chicken strips for not more than 5-7 mins. • When stir frying chicken, beat an egg lightly and add to the marinade, the chicken cooks much better. • Marinate everything for at least 20 mins. Source: SANHA e-Bulletin. To subscribe to the South African Halal Authority's e-Bulletin email consumer@sanha.org.za. The SANHA e-Bulletin has a circulation of over 30 000. 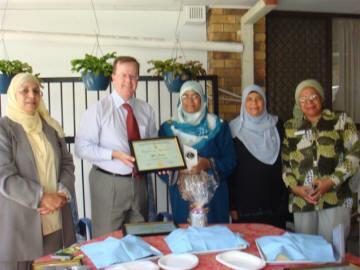 Islamic Society of Queensland Inc. will hold its annual Milaad-un-Nabi commemoration at Logan Community Centre on 29 March 2008. The program starts at 4.30 pm with children’s presentation, proceeded by naath, nasheed and Urdu lectures. 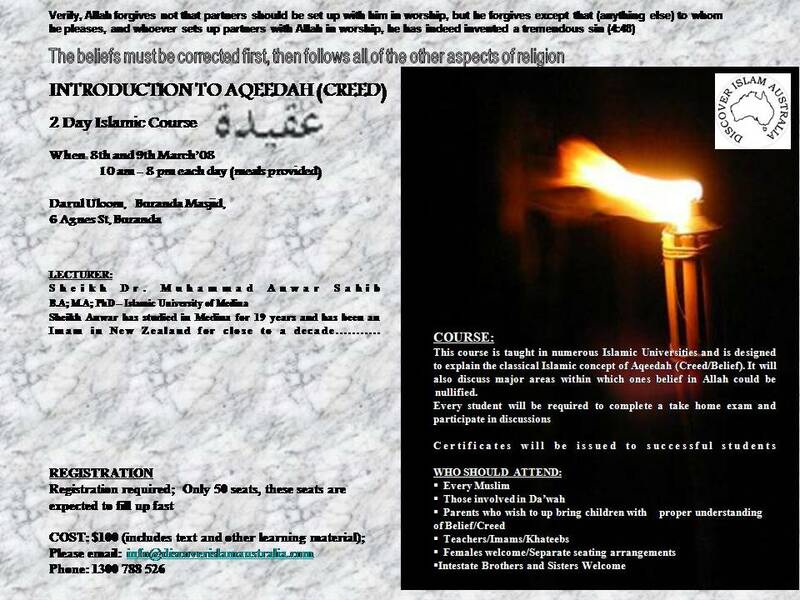 The conclusion will be with main lecture in English followed by Salaam and Dua. Dinner will be served after Eisha prayers at 8.00 pm. 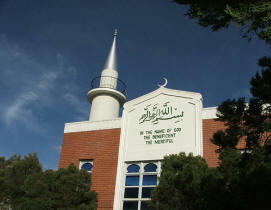 The guest speaker will be Imam Amien Ahmad al Qadari, resident Imam of Minto Mosque, Campbeltown, NSW. Imam Amien who hails from South Africa holds a BA degree (Majors in Arabic and Islamic Studies). All are welcome to attend this great program. Mula Nasruddin and his friend Jamaluddin were walking through the woods when a large bear walked out into the clearing no more than 25 meters in front of them. Mula Nasruddin dropped his backpack and dug out a pair of running shoes, then began to furiously attempt to lace them up as the bear slowly approached them. Jamaluddin looked at the Mula Nasruddin, confused, and said, "What are you doing? Running shoes aren't going to help, you can't outrun that bear." "I don't need to," said Mula Nasruddin, "I just need to outrun you."